The church depends upon the stewardship of its people. The people depend on and expect the church to be a good steward of its resources. The CDM+ Contributions program is a great help in the week-to-week task of recording giving. After contributions are recorded into the system, a variety of reports giving powerful analysis of the financial support to the church is immediately available. 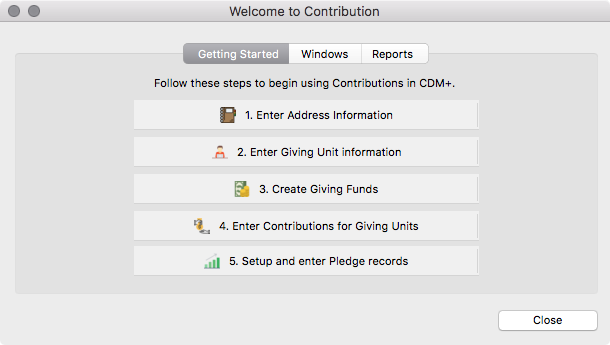 An unlimited number of different designations of contributions can be recorded in CDM+. These different designations are printed directly on the giving statements and are available on a variety of reports that show exactly how much was given to a particular project over a period of time. Giving statements can be printed (or emailed) at any time and reflect to a church’s contributors an accurate account of the receipt of their gifts. CDM+ can maintain an unlimited history of giving for each giving unit in the church. This information can be printed and averages of gifts per giving unit will automatically be calculated. What kind of stewardship program is needed for your congregation? CDM+ Contributions will give you helpful information about the past and current support to the church, so that just the right program can be implemented to help challenge the people of faith to be good stewards. 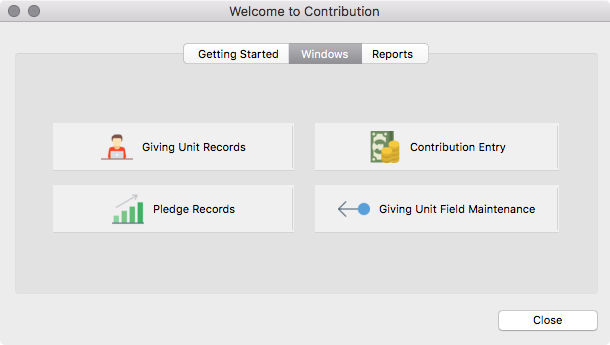 The Welcome to Contribution window in CDM+ is partitioned into three areas: Getting Started, Windows, and Reports. These functions are also easily accessible from the Program and Reports menus in CDM+ Contributions. These functions are also easily accessed from the Program and Reports menus in CDM+. 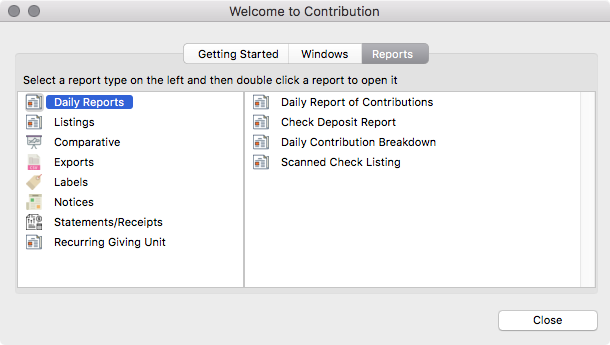 The Contributions toolbar in CDM+ is another handy shortcut for those who are entering or reporting on Contributions often. Toolbars are turned on and customized in User Preferences.